While John Stewart leads the Green Lantern Corps out of hiding and back into the universe, where they learn about the Sinestro Corps takeover, and Guy Gardner gets intimately acquainted with Sinestro's Fear Engine, the series' focus shifts back to Hal Jordan. After explaining the steps Soranik took to save Hal's life, the two sit down to catch up allowing the Green Lantern to heal and learn just what Sinestro has been up to in Hal's absence. 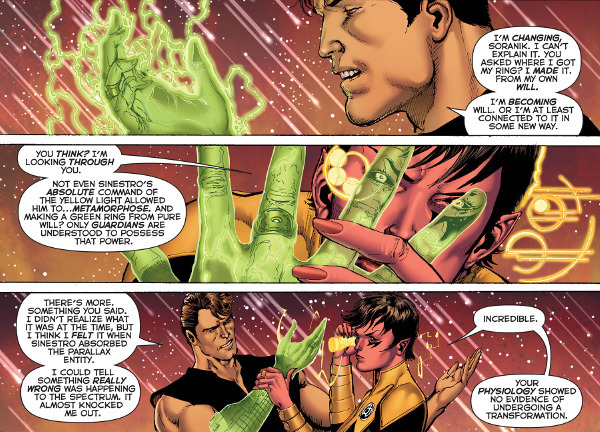 The scenes between Hal and Soranik are the highlight of a mostly action-free issue. Along with discovering what his arch-nemesis has been up to the dialogue also allows Hal to reveal that the metamorphosis which began before Rebirth continues to effect him in ways he can't yet explain. Soranik can offer no explanation about what is happening to her former teammate or where the changes may eventually lead. With Hal fully healed and raring to get back into action, the next issue should finally see a confrontation between former mentor and student as well as a possible reunion between Hal and other Lanterns who are headed after the Sinestro Corps. Worth a look.